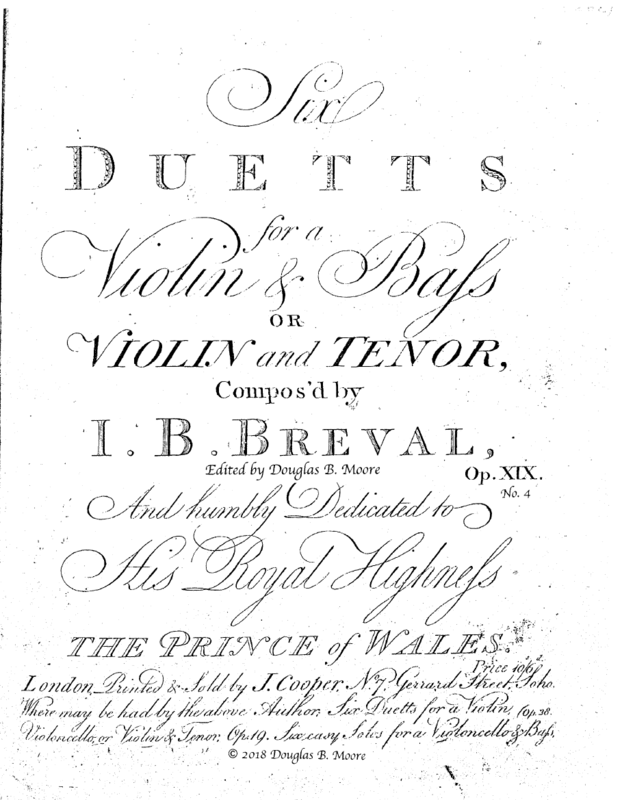 Bréval: Three Duetts for Violin and Viola, Op 19, No. 4 in A Major, No. 5 in B-flat Major and No. 6 in G Major. Facsimile of edition from early 1780s (parts only) and modern performing edition, score and parts. The Six Duetts for Violin and Viola were published in the early 1780s; the title page indicates the second parts may be played on bass (cello) as well, though those transpositions are not included here. No 4. The first movement is a sonata form, the second a brief Adagio, and the third a Rondo marked "Grazioso." No 5. There only two movements: the first is a sonata form and the second a theme with 3 variations. No 6. The first movement is a sonata form, the second an Adagio, and the third a Rondo [Presto] marked "Balabille", a Classic period corps de ballet dance, usually spelled Ballabile.